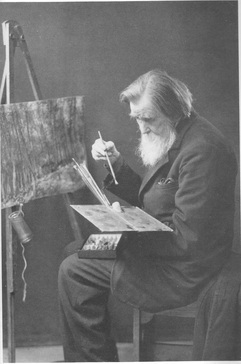 William Caparne painting a landscape. ​William Caparne was born in Newark, the son of Sophie Warwick and John Caparne, a music professor of Castlegate, Newark. His parents were both artists, and shared a love of gardening and flowers. He attended Newark Magnus Grammar School, being taught art by another famous Newark artist, William Cubley. Caparne's interest in the daffodil started in 1880, and many of his paintings were exhibited at the Royal Botanic Society, London and the Royal Horticultural Society Shows. It is thought that the daffodils portrayed here were from his Uncle's nursery in Newark, and planted on his mother's grave by 9 year-old William. He moved to Guernsey in 1896 with his daughter, Winifred, earning his living as a horticulturist and artist and he converted an old tramcar as an artist's studio, next to his cottage. He died in 1940, in Bon Port, Guernsey.